Cartographic maps are to Ariane Littman the raw material, the content, and the inspiration of her artwork. The field, which she encounters as a freelance news photographer during the years 2005-2008, becomes the physical space where reality is processed and later projected into new imaginary spaces in her studio. There, she can alter the reality of the Israeli-Palestinian conflict by removing borders and separation walls, boldly deconstructing the hegemonic power inscribed on the maps. Dwelling within competitive narratives Littman proposes, in her performance-video works, a critical reading of maps in which her body becomes the very site of an embodied cartography where geographic and artistic boundaries collapse. 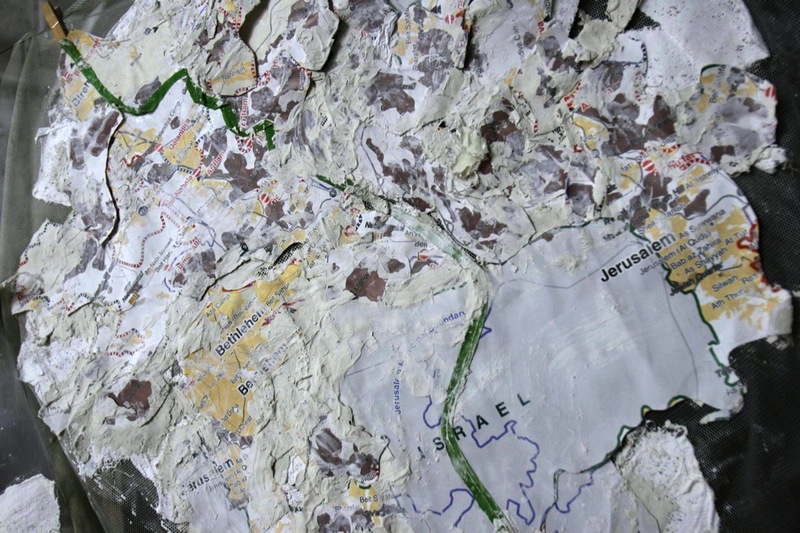 This movie reviews Ariane’s inventive uses of maps as it follows her to the edge of the city of Jerusalem in her perambulatory routes triggered by the Second Intifada, in a quest to transcend borders and fear. At the end of her peregrinations in the conflicting spaces of Border Land, Ariane, longing for healing, projects herself into the new fictional spaces of Wounded Land. There in a Sisyphean process, she bandages and sews with a green thread the collective wound that runs through the geographic and human landscape of the Holy Land.